Video wall controllers take one or several inputs, and split the content for delivery onto multiple displays, and generally enable administrators to manage the configuration and content of their video wall. This article provides a reference on the many approaches available nowadays, to help AV professionals choose the right solution for their requirements. These provide a simple and often affordable way to deploy smaller-sized video walls. Suitable when sizing requirements are known in advance and won’t change and when advanced control features are not needed. Offer limited maximum resolution, but do have the flexibility to show any input on any display, but the matrix switcher needs to be placed close to the displays (or requires signal extenders). Matrix switchers usually are compact devices that don’t occupy much space, but each “source” will still require its own PC or device. Management and configuration features are limited, usually consist of content routing, and basic video wall configuration usually via a PC connected to an RS232 interface. Scalability also is very limited, as to scale beyond the fixed number of inputs or outputs you’ll need to replace the device completely. Tangram Interior greets clients with eye-catching Userful Artistic video wall and Viewsonic displays at head office. These solutions integrate all, or most, video wall functionalities within a single device. Usually built within a proprietary PC/server chassis, the video wall controllers have multiple video cards with many inputs and outputs, with each video output driving one display in the video wall. 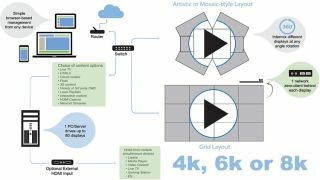 This approach supports higher resolution content and more advanced switching, providing the flexibility to display multiple simultaneous sources within the same video wall. However, they need to be pre-sized for your application and typically cannot scale beyond a certain size (e.g., 3x3 or 4x4) because of the limitations on how many video cards can be attached to a single PC. They typically come with a software offering advanced feature set, but are typically very expensive. Also, they face scalability limitations. The number of inputs and outputs is limited to the number of slots/video cards, and to expand, you would need to replace the device; and these controllers have to be relatively in close proximity to the video wall without the need for extenders. The network-based video wall approach is similar to the video card-based one, but it addresses most of the issues from the other approaches, such as the high cost of video wall processors (as it uses regular PCs, instead of proprietary hardware). All the content management, splitting and delivery is done in real time, and capture cards and network streaming source offer a wide range of inputs (like HDMI and SDI). The content is processed natively by the CPU (and often by the GPU as well), and a video wall controller software installed in this PC provides advanced configuration and content management tools. It also solves the scalability problem. The distance limitation is addressed, as the network infrastructure allows for greater distances, and many video walls can be located spread out across a building within the same network, and be powered from the same PC. A great advantage of software video wall controllers is that they are scalable and allow for future growth and changes in capabilities. A single software update can provide a whole new set of advance features and source content formats, support for higher resolutions, and more. There are solutions that are easy to setup and configure; others that provide very high resolutions and more control over your video wall; and others that simply don’t break your bank. A solution that balances all three aspects above, and fit better a broader set of requirements will ultimately ensure a higher rate of successful deployments. Video card based controllers output very high resolution content, and provide higher control over configuration and content management. Downside is that they are highly expensive and rely on proprietary hardware. They have limiting opportunities for system expansion; and maintenance is highly specialized, thus not highly available. Matrix switchers with scalers are the simplest approach, in part because of their limited configuration features, typically for video walls without much need for content management and control. LED / LDC displays with built-in video wall capabilities, also a simpler approach, provide a low-cost solution—usually comes with high-end commercial displays. However, future upgrades—like moving from 4k source content to 6k—would require the entire solution to be upgraded. Network based video walls (AV-over-IP) offer a low-cost and simple solution, with highly available maintenance. They are also capable of delivering high resolution content (for example, up to 8k in the case of Userful), and support advanced configuration and content management features, for greater control. They are highly scalable, as their only limitations are the PC resources and the network’s bandwidth—Gigabit for regular-sized video walls with 30fps content, or 10gig for large video walls with up to 60fps and 8k content. In conclusion, with any other technology market out there, we want a solution that fits a broader set of requirements (high flexibility), doesn’t break the bank (low-cost) and is easy to set-up and maintain. AV-over-IP provides video walls with high quality, at lower costs; offers many advantages for video walls and digital signage in general; and is highly future-proof —we can expect to see more and more of these solutions in the market.